If you are traveling to Disney World with an infant or toddler, naptime is a must. You may choose to return to your hotel each day for some quiet time, but if you can't, then seek out some of these nap-friendly spots in Disney World. These great nap locations offer comfortable seating or walking for mom or dad; noise levels are relatively low and there are no sudden loud noises or activity nearby. Even a 30-minute snooze will re-energize your child, and you will benefit from a break as well. The monorail is great for getting from one place to another, but it is also a great spot to lull a little one to sleep. The smooth motion and low noise levels create an ideal napping spot — and you won't have to remove a sleeping child from a stroller to board. Bring a book and ride around the loop several times for a cool and comfortable napping spot. Tip: Ride the resort monorail loop at any time of the day except when the Magic Kingdom is opening or closing—the monorail will be packed at those times. Both the Magic Kingdom and the Animal Kingdom offer slow moving trains that you can board and ride continuously. You can ride in comfort and catch glimpses of the park rides and attractions while your baby sleeps. Tip: Sit near the back of the train to avoid the loud whistle if you ride. This ride, formerly known as the "Wedway People Mover" will take you on a slow-moving trip around Tomorrowland in the Magic Kingdom. This ride seems custom made for a napping baby, and you'll enjoy resting your feet and cooling off as well. Note that this ride does pass through Space Mountain, but you won't be treated to any fast turns or loops. 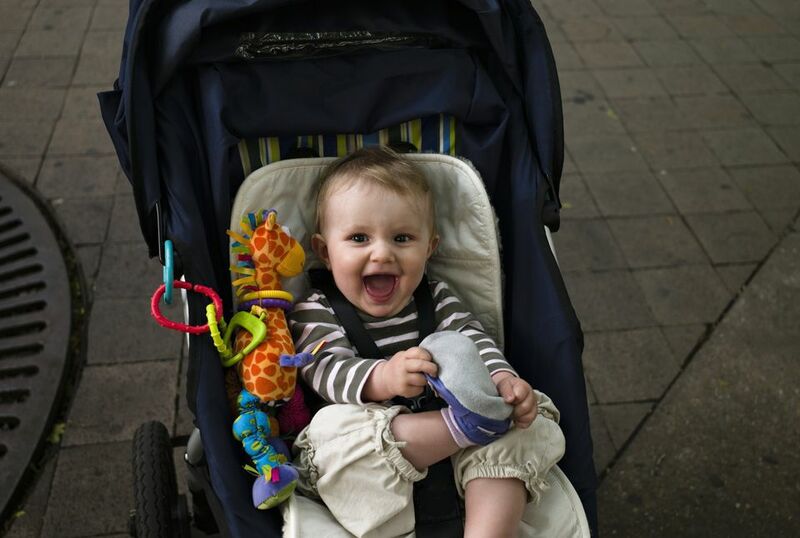 Tip: Consider packing a baby sling along with your stroller and other baby gear. If your infant falls asleep in a sling, you won't have to remove her as you get on and off of a ride. If you are in the Magic Kingdom, consider traveling to one of the nearby resorts, even if you are not a guest. Take the resort launch boat or monorail to the Polynesian or Grand Floridian and explore the resort while your child sleeps. Both locations offer shopping and food locations, and you can travel without removing a sleeping baby from the stroller. If your baby prefers to be walked, you can travel to the Contemporary or the Grand Floridian by foot as well. There are several trails and nooks in the Animal Kingdom that offer ample opportunities for napping. Check out the Oasis exhibits near the park entrance, the Discovery Island trails near the Tree of Life, and the animal exhibit trails in Asia and Africa. Tip: There are also several nicely shaded gazebos right outside of the Pangani Forest Exploration trail these are often overlooked by visitors and are cool and quiet. From the majestic falls of Canada to the serene art exhibits in Japan, you can find quiet spots for napping all around World Showcase in Epcot. Grab a drink, have a snack, or do some shopping while the baby dozes. Tip: World Showcase is great for daytime naps, but once musical performances start, areas around stages in Japan, America, Canada and the U.K. will be very noisy.